Feel better, stronger, more confident, vibrant and present in your life! We are all about healing and transformation; and we are proud to say that many of our new customers can't touch their toes or do a downward dog when they first come to classes, and that they feel comfortable being themselves in our classes without expectations, judgements or pressure. Many of our students have physical limitations, weight issues, health issues and emotional issues, and they come to work through them in a supported environment. We hand-pick our teachers based on their safe & knowledgeable approach, and we follow trauma sensitive teaching guidelines in how we connect with our students. We also offer select family-friendly classes so that you bring the family along. With lots of space to stretch out in class, we won't pack you in like sardines. It's not just about yoga; we offer all sorts of ways to help you to heal yourself, empower yourself in your life, and spread that joy to others. Read what our customers think of us. Classes to suit everyone, from beginner yoga and styles like yin and restorative yoga, to more challenging power classes for the seasoned yogis out there, plus meditative styles of yoga for those wishing to deepen their practice. Workshops are offered throughout the year in a range of healing modalities from yoga for stress relief, to sound healing, myofascial fitness, healthy eating, meditation, breathing techniques and many more. 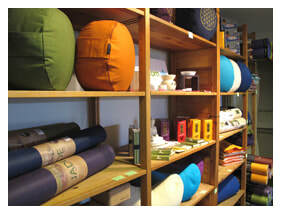 We also have a shop selling yoga mats, yoga equipment, meditation bolsters, salt lamps, clothing, gifts and yummy teas. 1500 ft of air-conditioned, beautifully designed, studio space with lots of room to stretch out and breathe, changing area, two washrooms, yoga mats and lots of equipment. Plus our SHOP out front sells an extensive range of yoga equipment, clothing & gifts. We are wheelchair accessible and welcome those with disabilities. There is also free parking behind the studio evenings & weekends. We provide everything you need to get started - except for the commitment, that comes from you! our phenomenal carefully-selected teachers all have an innate ability to help you release in your body in a safe and intuitive way. Fully qualified and certified in yoga and many other disciplines, they lead classes with compassion and soul and come from eclectic backgrounds in healing, bodywork, yoga and meditation. We're here to encourage and support you. Don't hesitate to ask for help or advice.